This blog is no longer active or being updated. Welcome to the animal world! Take a journey into the past! 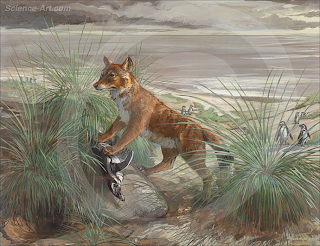 seabirds, lizards, bug larva, and some vegetation (Judging by the feeding habits of the Maned Wolf who is a omnivore, an animal who eats both plants and animals) The Warrah had no natural enemies where it lived so when humans arrived on the island the Warrah didn't have a fight or flight instinct so it was unafraid of people (the same thing happened to the Dodo bird). This, like the dodo lead to its scientific name Dusicyon australis (do-sih-sigh-on aus-trili-us) meaning: Foolish dog of the south. 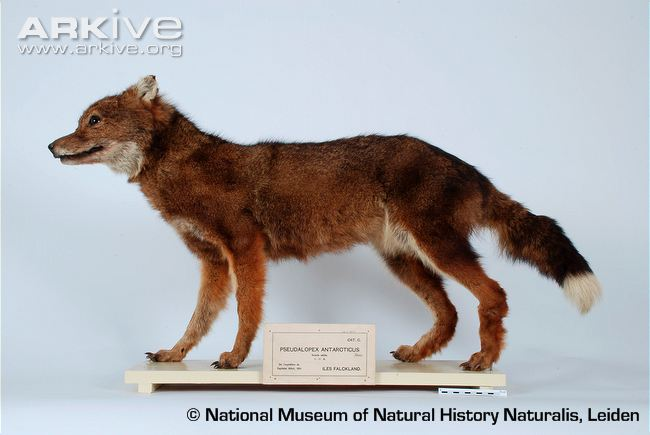 The Warrah was the first canid (dog) to go extinct in modern times. When people first settled on the islands they felt threatened by the wolf because they thought that they were going to eat their sheep. In reality the Warrah was not built to take down large prey like sheep, and unlike the rest of the dog family the Warrah didn't live in packs because their was no need to bring down large prey since their was no large native animals on the island. The Aurochs (or-ox) or Urus was the ancestor of most domestic cattle today, some still resemble their ancestor. The Aurochs was domesticated around 10,500 BC making the cow the 3ed oldest domestic animal in history. 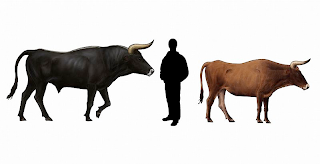 Unlike most of todays cattle the Aurochs differed in color and size depending on gender, the male was a dark brown or black with a white stripe down the back, the female was a reddish-brown, slightly smaller and no white stripe. Like the Tarpan (ancestor of the modern horse) their was a breeding project to try to bring back the Aurochs. This resulted in the breed Heck Cattle, but their are many differences in the Heck Cow compared to the real animal for example the Heck Cattle are smaller, have shorter neck, legs and head, vary loose skin, the colors are not vary different from male to female, and the horns are small and pointed upwards. The list goes on. Please report any missing pictures or video you come across. Just leave a comment at the bottom of the page you are on.